Okay, so it’s not strictly food, but it’s delicious so work with me here. I’ve had a pretty busy week, and unfortunately, just haven’t had time to experiment with anything more adventurous than pasta pesto in the kitchen. I first came across the drink in Dirty Martini a few years back. It was my flatmate’s birthday and so we all went to a cocktail making class. The bartender taught us to make four different cocktails and this was far and away my favourite of the night. When said flatmate and I threw a cocktail party a few weeks ago, this was number one on my list to make. 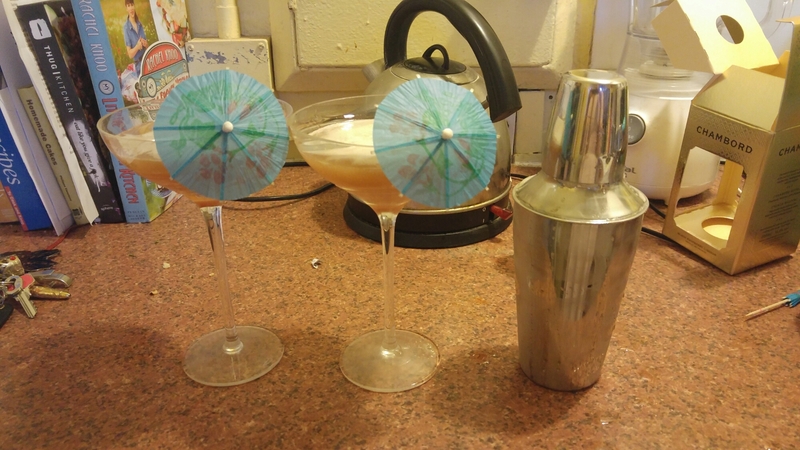 We bought a cocktail shaker online, as well as a box of paper umbrellas. Hey, if you’re going to have a cocktail party, why not go all out, right? Throw the mixture into a shaker with some ice and shake vigourously. The pineapple juice gets really frothy, so when you take the lid off the shaker, beware, some will come flowing out. Pour into a chilled glass, decorate with an umbrella, hand one to a friend and enjoy! Why not give it a try this weekend? I can say from experience that it’s the perfect way to end a long week.